Reading Joseph Millum's book, The Moral Foundations of Parenthood, I find myself feeling a lot of admiration for the book's intricacy and clarity, but also find myself in maximal disagreement. Chapter Two, on the acquisition of parental rights, is especially unconvincing. 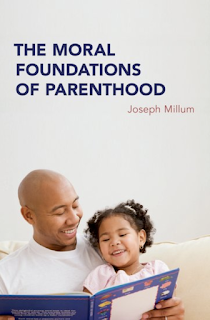 Millum proposes an "investment" account: you become a moral parent, a person with certain rights over a child, by doing work on the child's behalf. So parenthood is owed to the parent--it's what's deserved as a reward for the parent's investment. Non-workers don't have parental rights. I don't find this very plausible. Start with a child born to a mother in the typical way. I have an unbudgable commitment to the view that the mother is a moral parent, but I don't think the investment theory does a good job of explaining this, as much as Millum does want it to. Millum says the mother has worked to produce the child, so the mother is a moral parent of the child. But is pregnancy work in the relevant sense? Pregnancy is burdensome and so is work (often). But of course, it would be illogical to conclude that pregnancy is work. All that is burdensome is not work. It's burdensome to endure the flu, but it's not work; you're not owed anything for enduring it. It's burdensome to menstruate, but not work; but you're not owed anything for enduring it. Biological fathers get to be moral fathers, on the investment theory, but only to a minor degree before the child is born. All they can do is support the pregnant woman, which is a small contribution compared to pregnancy. Biological fathers who don't know about the pregnancy and can't contribute aren't moral fathers at all. Millum is prepared to bite these bullets, but there are limits to how counterintuitive he wants his theory to be. He doesn't want it to turn out that nannies are moral parents because of all the work they do on behalf of children. How to avoid that conclusion? So the theory is actually more complicated than it would first appear. The account of parental rights actually needs the account of responsibilities that Millum provides later in the book (ch. 4). The idea is that working to benefit a child gives me a stake in the child, making me a moral parent, to the extent that in doing the work or having it done, I'm fulfilling my responsibility to the child. So the nanny doesn't acquire a stake in the child, no matter how hard she works, because she doesn't have, and isn't fulfilling, responsibilities to the child. Not only that, but I do acquire a stake, by hiring her: "the parent, not her employee, will be deserving of the stake generated by the parental work." If I had the intuition that moral parenthood was a reward for parental work, I think I would mightily resist the idea of treating doing working, and having work done, as equivalent in their power to give a parent a stake in a child. Surely British aristocrats of yore couldn't acquire a stake in their children by having governesses do the generic work; nor can traditional fathers acquire a stake in their children by having traditional mothers do the generic work. Supposing that these people are parents, it's not at all because they deserve a reward for having other people do the work of caregiving. My own view is that having parental rights in the core case (biological reproduction) centrally involve the simple fact that children come from other people (I elaborate in my book The Philosophical Parent). The case of the mother is most straightforward. The baby was once a part of the mother or at least generated from her parts. We don't have to say that baby-making is work to attach significance to the child's development inside the mother. A tooth falls out of Johnnie's mouth. Is it his to leave for the Tooth Fairy, or can his buddy George grab it? It's his, of course. And of course he didn't in any meaningful sense work to produce that tooth. A brilliant idea pops into my mind, and I write it down. I didn't exactly work for the idea--it just occurred to me. But it's origin in my mind gives me intellectual rights with respect to the idea. I think a mother's entitlement to her newborn is related to such things, not to the notion that work deserves a reward. The problem with attaching significance to these causal facts (this baby comes from this mother), in the case of procreation, is supposed to be that babies have all sorts of causes--not just the mother and father (p. 43). There are obstetricians, grandparents, etc. But similarly, ideas have all sorts of causes, as do teeth. I still think I have a right to the ideas and teeth that proceed out of my own head, and likewise have certain rights with respect to any baby that's the product of my own body.